Udupi, Aug 18, 2018: Intensified sea erosion at Malpe Thottam and Padukere is serious cause for concern. Huge waves that lash the shore are taking away the coconut trees. The families living beside the shore are in distress. As the retaining wall is not constructed at Malpe Thottam area, the sea water has entered the houses. Already, several trees have been washed away in the fury of the sea. “Many people are eking out livelihood through these coconut trees at Thottam. 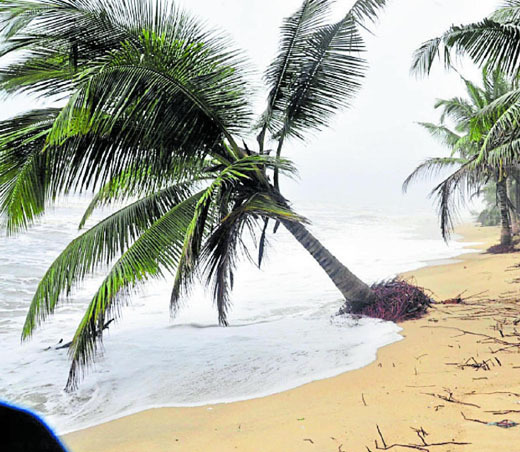 Now, we are losing all the coconut trees,” the residents said. “The huge waves that lash the shore are scary. We are spending sleepless nights. Boulders should be dumped in the affected areas,” they said. Even the electricity poles are on the verge of collapse. The Malpe beach wears a deserted look with lack of tourists. Heaps of plastic, liquor bottles and sandals have been washed to the shore. CCTV Cameras are damaged. Visitors have been prevented from entering into the sea.